Background and objectives Atypical hemolytic uremic syndrome (aHUS) is a rare complement-mediated kidney disease that was first recognized in children but also affects adults. This study assessed the disease presentation and outcome in a nationwide cohort of patients with aHUS according to the age at onset and the underlying complement abnormalities. Design, setting, participants, & measurements A total of 214 patients with aHUS were enrolled between 2000 and 2008 and screened for mutations in the six susceptibility factors for aHUS and for anti–factor H antibodies. Results Onset of aHUS occurred as frequently during adulthood (58.4%) as during childhood (41.6%). The percentages of patients who developed the disease were 23%, 40%, 70%, and 98% by age 2, 18, 40, and 60 years, respectively. Mortality was higher in children than in adults (6.7% versus 0.8% at 1 year) (P=0.02), but progression to ESRD after the first aHUS episode was more frequent in adults (46% versus 16%; P<0.001). Sixty-one percent of patients had mutations in their complement genes. The renal outcome was not significantly different in adults regardless of genetic background. Only membrane cofactor protein (MCP) and undetermined aHUS were less severe in children than adults. The frequency of relapse after 1 year was 92% in children with MCP-associated HUS and approximately 30% in all other subgroups. Conclusion Mortality rate was higher in children than adults with aHUS, but renal prognosis was worse in adults than children. In children, the prognosis strongly depends on the genetic background. Complement genetics have dramatically changed our understanding of atypical hemolytic uremic syndrome (aHUS), a thrombotic microangiopathy mainly involving the kidneys. In the last decade, aHUS has been linked to dysregulation of the alternative C3 convertase leading to complement-induced endothelial damage and ultimately thrombotic microangiopathy (1). Various hereditary or acquired deficiencies in the complement alternative pathway proteins have been identified, including (1) inactivating mutations in the genes coding for regulatory proteins of the alternative pathway C3 convertase (C3bBb), factor H (CFH), factor I (CFI), membrane cofactor protein (MCP), or thrombomodulin (THBD); (2) anti-CFH antibodies associated with homozygous CFHR1-CFHR3 deletion (2); and (3) gain-of-function mutations in the genes coding for two components of the C3bBb convertase, factor B (CFB) (3) and C3 (4). In addition, common single-nucleotide polymorphisms (SNPs) or haplotypes in the CFH, CFHR1, and MCP genes are susceptibility factors for aHUS (5–8). With the increasing complexity of complement regulation defects associated with aHUS, the best possible description of the relationships between complement abnormalities and disease outcome is crucial. The genetic screening of patients with aHUS from national or international registries has provided an estimation of the frequency of mutations in the complement genes (9–12). In contrast, our knowledge of the presentation and outcome of aHUS derives from only a few series (9,13,14). We conducted a nationwide study of French pediatric and adult aHUS cases to assess the effect of complement gene mutations on the age at onset, disease expression, and outcome. We included patients with atypical HUS who received care in France, excluding all cases of secondary aHUS except pregnancy. Thus, we excluded patients with HUS secondary to drugs, autoimmune diseases, infections (caused by Shiga toxin–producing Escherichia coli, Streptococcus pneumoniae, or HIV), bone marrow or solid organ transplantation, and cobalamin deficiency. However, three patients who had HUS caused by Shiga toxin–producing E. coli at the first episode were included in this study because they had subsequent relapses or familial HUS. Two groups of patients were individualized according to their age at onset, either <16 years (pediatric-onset, categorized as “children”) or ≥16 years (adult-onset, categorized as “adults”). Plasma treatment was subdivided into two subsets according its intensity: High-intensity treatment was defined by a volume of fresh frozen plasma infused at a rate of >10 ml/kg per day for at least 5 days or by at least five plasma exchanges over <10 days; all other cases, included those in whom plasma was not administered, were categorized as having received low-intensity/no plasma. Comparisons of variables distribution between different groups were performed using the Chi-square test. All coding sequences of the CFH, CFI, MCP, C3, CFB, and THBD genes were sequenced as previously described (15). Screening for complex genetic disorders affecting CFH, CFHR1, and CFHR3 secondary to nonallelic homologous recombination was undertaken using multiplex ligation–dependent probe amplification from MRC Holland (www.mlpa.com) and homemade probes that are available on request. Two hundred unrelated healthy French individuals were included in the study as a French control group. We identified 214 patients who met the diagnostic criteria for aHUS. Between 2000 and 2008, the mean number of patients referred each year at the time of the first episode of aHUS was 15 (range, 8–21), suggesting that the annual incidence of aHUS is at least 0.23/year per 106 people in the French population. The patients’ characteristics at the onset of aHUS are summarized in Table 1. Onset of aHUS occurred during adulthood in 125 (58%) patients and during childhood in 89 (42%) patients. The age at onset ranged from 1 day to 85 years. The percentages of patients who developed the disease were 23%, 40%, 70%, and 98% by age 2, 18, 40, and 60 years, respectively. Among the pediatric patients, 56% (50 of 89) experienced disease onset before age 2 years, and 65% (81 of 125) of the adults experienced onset between age 20 and 40 years. The female-to-male ratio was 3 in adults and 0.9 in children (P<0.001). Gastroenteritis or diarrhea in children and pregnancy in adults were the main precipitating factors for aHUS. Eight percent of adults and 16% of children presented with neurologic manifestations (altered consciousness or coma, seizures, and focal neurologic deficits). Renal involvement was more severe in adults, with 81% requiring dialysis at the first aHUS episode compared with 59% of children (P<0.001). The 214 patients were from 200 unrelated families. The frequency of mutations in the complement genes was 60.2% (129 of 214). None of the mutations was detected in the French control group. HUS was familial in 28 of the 200 families (14%) (Table 2). We identified 54 families with a CFH mutation (45 of 200 [22.5%]) or with nonallelic homologous recombination between CFH and CFHR1 (9 of 200 [4.5%]). Mutations in the MCP, CFI, C3, and CFB genes occurred at frequencies of 10%, 9%, 8%, and 1.5%, respectively, among the families included in the study. More than one mutation was detected in 4% of families. None of the patients presented an isolated THBD mutation. A mutation was detected in 20 of 28 familial forms of aHUS (71.4%). Half (14 of 28) of the familial forms had a mutation in CFH or MCP. The frequency of mutations was not significantly different between the familial and sporadic forms of aHUS. Anti-CFH antibodies and mutations in CFI were detected only in patients with sporadic aHUS. Four rare variants in MCP, C3, CFI, and CFH identified in patients and controls were not considered as mutations (Supplemental Table 1). A total of 85 sequence alterations were identified in the coding regions or intron-exon boundary junctions of CFH, MCP, CFI, C3, and CFB genes (Figure 1). A total of 6 homozygous MCP mutations and 3 homozygous CFH mutations were identified. All other mutations were heterozygous. A total of 43 different mutations of CFH, scattered throughout the CFH coding region, were identified by direct sequencing analysis in 59 patients. Fourteen mutations (14 of 43 [32.5%]) were located in short consensus repeat (SCR) domains 19–20. Twenty-four of 43 mutations (56%) were associated with decreased CFH plasma levels (type I mutations), and 19 of 43 (44%) were associated with a normal CFH level (type II mutations). All but 1 (R69W) of the 11 independent mutations in MCP were associated with decreased MCP expression (type I mutation). 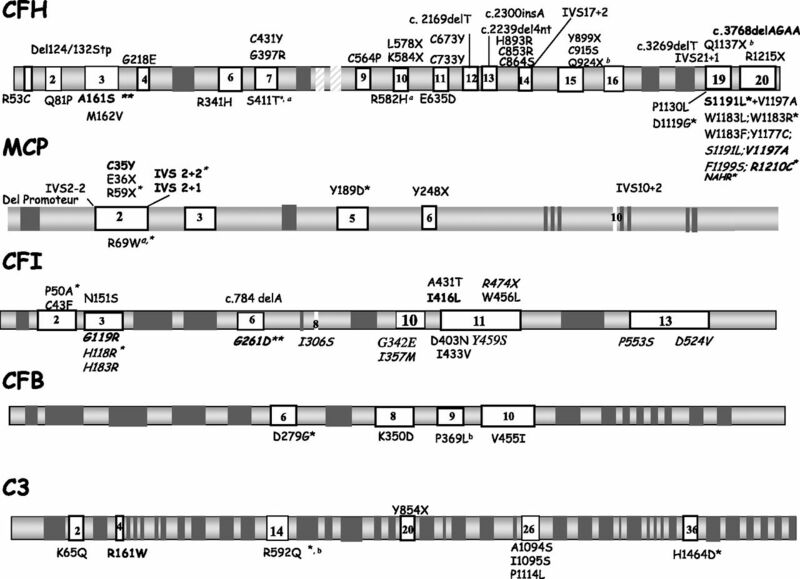 Eight of the 19 CFI mutations found in 19 patients were type I mutations. Two of the 4 CFB mutations and 4 of the 8 C3 mutations were demonstrated as gain-of-function mutations (3,4,16). The functional consequences of the other CFB and C3 mutations are unknown. Summary of the 85 mutations in the CFH, MCP, CFI, CFB, and C3 genes identified in the national French cohort of 214 patients with atypical hemolytic uremic syndrome (aHUS). The nucleotide and amino acid numbering refers to the translation start site (A in ATG is +1), as recommended by the Human Genome Variation Society. The genetic changes reported here were not found in any control, and none is reported in the single nucleotide polymorphism (SNP) databases with the exception of the ultra-rare SNPs G119R, H183R, G261D, I416L, and P553S. For CFH, CFI, and MCP genes: Type I mutations (protein level below the normal range) are located above the schematic representations of the genes, and type II mutations (normal protein level) are indicated below. Among the type II mutations, four were detected in the CFH N-terminal short consensus repeats 1–3, including three in the C3b binding site (Q81P, M162V, and A161S) and one (R53C) affecting an exposed residue on the opposite surface short consensus repeat 1, which, although not in contact with C3, could affect the local protein conformation. aMutations in the CFH gene associated with a complex CFH rearrangement identified using multiplex ligation–dependent probe amplification. bMutations found in 4 patients associated with THBD genetic changes: A43T(n=3) and P501L (n=1). *Mutations found in familial forms (but not exclusively). **The two mutations that did not segregate with the disease (i.e., they were found in one family member with aHUS but not in another member of the family also with aHUS). Bold characters indicate 13 mutations identified in two or more unrelated patients, suggesting that they may represent mutational hot spots. Among these mutations, two variants, G261D and I416L in the CFI gene, are rare SNPs. CFB, complement factor B; CFH, complement factor H; CFI, complement factor I; MCP, membrane cofactor protein; THBD, thrombomodulin. The C3 serum level was low at the first assessment in 77 of the 214 patients (35.9%). A low C3 level was mostly associated with CFH type I mutations, CFH type II mutations in SCR1 and 2, and gain-of-function mutations in CFB and C3 (Supplemental Figure 1 and data not shown). The frequencies of two SNPs in the CFH gene (one in the promotor and one in SCR16), one SNP in the MCP promoter and of the variant CFHR1*B were significantly increased in aHUS cases compared with controls, whereas the CFH SNP in SCR7 conferred a significant protective effect (Supplemental Table 2). At-risk CFH tgtgt and MCP ggaac haplotypes increased the risk of aHUS by fourfold and threefold, respectively. In total, 33%, 23%, and 12% of the 159 patients without anti-CFH antibodies were homozygous for the at-risk haplotype MCP ggaac, CFH tgtgt, or both, respectively (versus 8%, 5%, and 0% in the controls; P<0.0001). The patients’ outcomes are shown in (Supplemental Table 3). The median follow-up duration was 57 months in adults and 45 months in children. Nine patients (4.2%) died during the course of aHUS (Supplemental Table 3 and Supplemental Table 4). The mortality rate was significantly higher in children than in adults (6.8% versus 0.8% at 1 year and 7.8% versus 1.6% at the end of follow-up) (P=0.02). Forty-six percent of adults and 17% of children reached ESRD or died within <1 month after onset (P<0.001). Fifty-six percent of the adults and 29% of the children required renal replacement therapy or died within 1 year of follow-up (P<0.001) (Supplemental Table 3). Relapses occurred in 43% of children and 35% of adults who survived the first aHUS episode without reaching ESRD (P=0.3). Altogether, 57% (16 of 28) and 82% (19 of 23) of the first aHUS relapses occurred during the first year of follow-up in children and adults (P=0.9), respectively. Among the patients who were alive and without ESRD at 1 year, 47% (25 of 53) of the children and 20% (11 of 55) of the adults experienced at least one relapse during the follow-up period (P=0.0002) (Supplemental Table 3). The Kaplan-Meier estimate of the 5-year survival without ESRD was 64% in children compared with 36% in adults (P<0.001) (Figure 2). Cumulative Kaplan-Meier estimates of the rates of patients without ESRD or death according to the age at onset. Overall, the renal survival was significantly better in patients with early onset than in those with late onset. aHUS, atypical hemolytic uremic syndrome. Patients with mutations in the MCP gene presented a significantly earlier onset of the disease than patients with CFH, CFI, or no identified mutation (Figure 3). The distribution of age at the onset of the disease did not differ significantly between patients with CFH, CFI, C3, and no identified mutation. We identified 10 children and 4 adults with anti-CFH antibodies. The median age at the time of disease onset was 9.5 years in children (range, 8 months–13 years) and 31.5 years in adults (range, 21–45 years) (Supplemental Table 5). Heterozygous CFH mutations were significantly more frequent in adults than in children (32% versus 16.8%; P=0.01), whereas the presence of anti-CFH antibodies was significantly more frequent in children (11% versus 3.2%; P=0.03), and homozygous CFH mutations were observed only in children (Table 3). A total of 42% (25 of 59) of patients with CFH mutations experienced onset of the disease between age 20 and 40 years. No case of MCP-associated aHUS began before 1 year of age (Supplemental Figure 2). The frequency of the tested SNPs in the CFH and MCP genes and that of the at-risk haplotypes did not differ significantly between children and adults (Supplemental Table 2). A female predominance was observed in all subgroups in adults. Percentage of the patients who developed atypical hemolytic uremic syndrome at a given age according to the complement genetic abnormality. The percentages of patients who developed the disease were 23%, 40%, 70%, and 98% by age 2, 18, 40, and 60 years, respectively. CFB, complement factor B; CFH, complement factor H; CFI, complement factor I; MCP, membrane cofactor protein; THBD, thrombomodulin. In adults, the incidence of ESRD or death was not significantly different according to the genetic background. CFH mutations were associated with a significantly worse renal prognosis compared with other subgroups in children (Supplemental Figure 3). The renal outcome was poor in patients with CFH mutations regardless of the age at onset (Figure 4). The Kaplan-Meier estimate of the 5-year survival without ESRD was significantly worse for adults with MCP mutations or no identified genetic abnormalities than in children with the same genetic pattern, whereas no significant difference was observed for mutations in the CFH, CFI, or C3 genes (Figure 4). Children with MCP mutations retained a relatively good long-term renal outcome, with a 25% risk of reaching ESRD (median follow-up, 17.8 years). 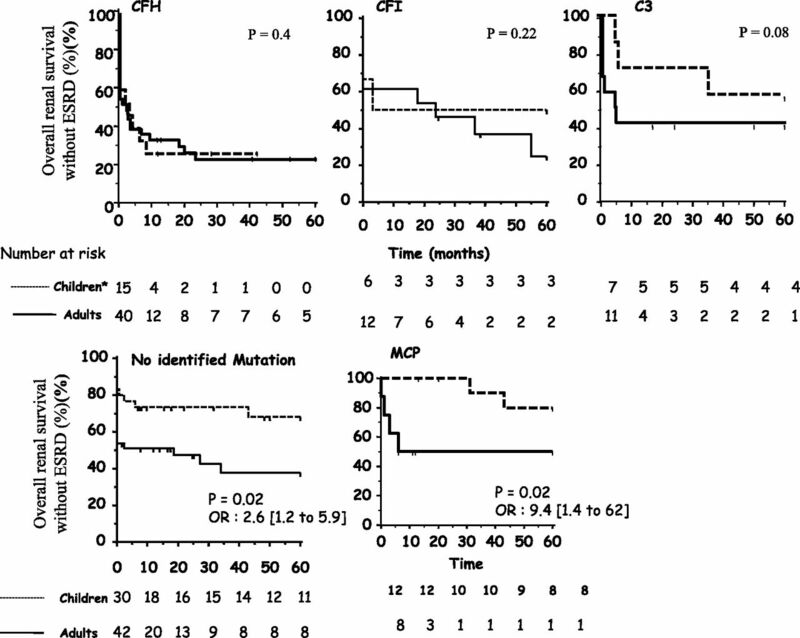 The prognosis of anti-CFH antibody HUS in children was also relatively favorable and not significantly different from that of MCP-associated HUS (Supplemental Figure 4). The frequency of relapse after 1 year was 92% in children with MCP-associated HUS and 19%–50% in all other subgroups (Supplemental Table 3). Cumulative Kaplan-Meier estimates of the rates of patients without ESRD or death according to the age at onset in patients with CFH, MCP, CFI, or C3 mutations or no mutation identified and no anti-CFH antibodies. *CFH mutations: only children with heterozygous mutations are taken into account for this figure. CFB, complement factor B; CFH, complement factor H; CFI, complement factor I; MCP, membrane cofactor protein; THBD, thrombomodulin. In adults and children, the risk of reaching ESRD after the first episode of aHUS was similar in the low-intensity/no plasma group and the high-intensity group in all subgroups (Supplemental Table 6). We have defined the clinical outcome of aHUS in a nationwide French cohort of 214 adults and children. To our knowledge, this is the second largest cohort of patients to be screened for mutations in all six of the genes established as susceptibility factors for aHUS (CFH, MCP, CFI, CFB, C3, and THBD) and for aHUS at-risk SNPs in CFH, MCP, and CFHR1. The influence of mutations in complement genes on the aHUS clinical phenotype was first documented on the basis of a cohort from an international registry that includes 17% of secondary aHUS cases (9). We decided to focus our own analysis on a cohort of patients from a single country and to exclude all cases of secondary aHUS except pregnancy-associated aHUS. Thus, our study design provides a highly representative picture of the spectrum of the disease in the idiopathic aHUS form. Our data confirm that aHUS is a complex multigenic complement-mediated disease (1). We identified mutations in one or two complement genes or the presence of anti-CFH antibodies in 66.3% of patients and established a strong association of aHUS with polymorphisms in the CFH and MCP genes, in accordance with previous reports (5,7,17). In our cohort, >40% of the patients were homozygous for the CFH tgtgt or the MCP ggaac at-risk haplotypes. We also confirmed that the newly identified CFHR1*B polymorphism confers an increased risk for aHUS (8). In addition, we analyzed the distribution of these at-risk SNPs according to the age at aHUS onset and did not find any significant difference between adults and children, thus excluding the hypothesis that early onset of aHUS might be linked to the presence of at-risk polymorphisms in addition to mutations. Our results highlight the fact that these polymorphisms, all located in the regulator of complement activation locus, play a major role in the development of aHUS during all life stages and should be considered during genetic counseling, as demonstrated in families with gain-of-function C3 R139W mutations (4). This study sheds a new light on the clinical presentation and outcome of aHUS. We identified 28 familial forms of the disease represented by 19% of the patients, which is lower than the frequency of 30% of familial cases reported in an Italian cohort (9). Our study emphasizes that aHUS is not predominantly a pediatric disease; approximately 60% of all cases occurred during adulthood. This finding is in sharp contrast to the common opinion that aHUS occurs mainly during childhood (1). 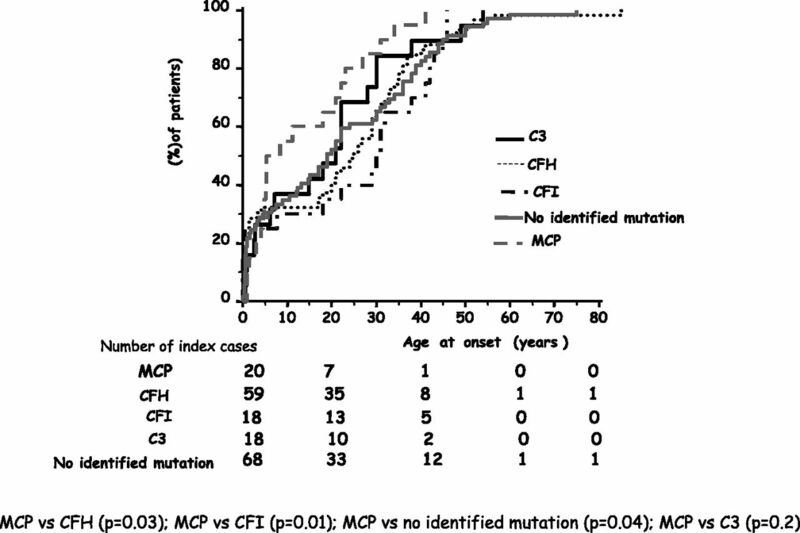 We showed that only patients with MCP mutations have a significantly earlier distribution of age at onset compared with patients with CFH or CFI mutations or no identified mutations. In addition, we also showed that 23% of all patients and 56% of children experienced disease onset before age 2 years, highlighting that early life is a critical period. We confirmed that the age at onset of aHUS in children had a specific distribution according to type of complement dysregulation. For instance, anti-CFH antibodies and MCP-associated HUS occurred mainly between age 2 and 12 years in children (2,9,13). Along with infectious events (mainly in children), pregnancy was a major precipitating factor of aHUS in adults, as previously reported (18). Independently of pregnancy, aHUS emerges in adults as a disorder that mainly affects female patients, regardless of the presence or absence and the type of mutation. This finding remains unexplained. Four percent of patients died, an incidence that is lower than the mortality rates reported in a previous large cohort (9) (e.g., 19% at the first episode in CFH-associated aHUS  versus 5% [3 of 59] at 1-year follow-up in the present cohort). This discrepancy may be due to the previous study’s inclusion of selected cases with severe aHUS. All things considered, aHUS ultimately has a bad prognosis in adults, with 56% of patients progressing to ESRD within the first year of the disease, regardless of the presence or absence or the type of complement dysregulation. However, we showed that adults and children with CFH, CFI, and C3 mutations had a similar poor outcome. We confirmed that MCP mutation carriers had a good prognosis despite frequent relapses, but this was true only if the first episode of the disease occurred during childhood. Of note, the prognosis in the subgroup of adults without identified mutations, despite an extensive genetic analysis including screening for nonallelic homologous recombination, was as poor as in other subgroups. In contrast, the prognosis of unexplained and MCP-associated aHUS was similar in children. This difference could be due to unknown severity factors that are specifically implicated in adults. Our data also provide a reassessment of the long-term relapse pattern of aHUS. The risk of relapse is approximately 40% in our series, as previously reported by Noris et al. (9). For the first time, we showed that 19 of the 23 (82%) relapses in adults occurred during the first year. Thus, careful monitoring of patients is crucial during the first year of follow-up. In addition, our data highlight that the risk of relapses after the first year decreases to approximately 25% in all patients except children with MCP-associated HUS. Therefore, tapering of the therapeutic strategy to prevent relapses could reasonably be considered. The identification of mutations will remain useful to confirm the diagnosis of complement-mediated disease, for genetic counseling, for the assessment of the prognosis, and potentially for determining the duration of treatment and the treatment choice for the prevention of post–kidney transplant recurrence. The effect of plasma therapy on the outcome of aHUS remains ill defined. It has been proven difficult to retrospectively assess the effect of such treatment in patients who present with variable severity of renal failure; patients who have various types of complement dysregulation; and those who received plasma therapy with a highly variable delay, intensity, and duration. More than half of the adult patients with CFH mutations reached ESRD at the first episode of aHUS despite high-intensity plasma therapy. Although the intensity of such plasma therapy can be questioned, there is obviously a need for a more efficient treatment in these patients. Finally, the efficiency of plasma therapy remains unproven in aHUS today, in contrast to ADAMST13 deficiency–associated thrombotic microangiopathy. The goal of any treatment in aHUS is to rapidly halt and subsequently prevent complement-mediated damage to the arteriolar and glomerular endothelial cells and thus preserve kidney function during the acute phase and over the long term. If we consider that ESRD may occur as soon as the first episode, aggressive treatment during the acute phase is mandatory. This series of patients with aHUS from the pre-eculizumab era will be helpful for decisions concerning the indications and duration of eculizumab treatment, the new therapeutic option for aHUS (19–21). J.Z., F.F., C.L., and V.F.B. have received fees from Alexion Pharmaceuticals for invited lectures. V.F.B., F.F., P.N., and C.L. are members of an expert national board supported by Alexion Pharmaceuticals. The authors thank A. Blanchard, C. Andrieux, and the Centre d’Investigation clinique (Hôpital Européen Georges Pompidou) for recruiting healthy donors. We would also like to thank all the members of the French Study Group for aHUS who participated in fruitful and constructive discussions: M. Buchler (Tours), S. Burtey (Marseille), D. Chauveau (Toulouse), Y. Delmas (Bordeaux), G. Deschênes (Paris), A. Garnier (Toulouse), M.Y. Hourmant (Nantes), A. Karras (Paris), B. Knebelmann (Paris), Y. Lebranchu (Tours), B. Legallicier (Rouen), C. Legendre (Paris), M. Le Quintrec (Suresnes), B. Moulin (Strasbourg), P. Niaudet (Paris), C. Pouteil-Noble (Lyon), F. Provot (Lille), B. Ranchin (Lyon), and E. Rondeau (Paris). The authors thank all the clinicians who referred their patients for complement investigations: J.L. Andre (Nancy), V. Baudouin (Paris), A. Bensman (Paris), E. Berard (Nice), B. Boudaillez (Amiens), S. Decramer (Toulouse), F. Broux (Rouen), G. Champion (Anger), S. Cloarec (Tours), L. Couzi (Bordeaux), P. Eckart (Caen), M. Fischbach (Strasbourg), M. Foulard (Lille), M.F. Gagnadoux (Paris), S. Gie (Rennes), P. Gobert (Avignon), J.P. Grunfeld (Paris), G. Guest (Paris), B. Hurault de Ligny (Caen), B. Lianas (Bordeaux), M.A. Macher (Paris), A. Maisin (Paris), R. Makdassi (Amiens), D. Morin (Montpellier), V. Esnault (Nice), G. Touchard (Poitiers), H. Nivet (Tours), F. Nobili (Besançon), B. Ranchin (Lyon), J. Pourrat (Toulouse), R. Salomon (Paris), S. Taque (Rennes), M. Tsimaratos (Marseille), H. Vacher Coponat (Marseille), E. Cassuto (Nice), M. Delahousse (Paris), D. Le Chapois (Bourges), C. Legendre (Paris), P. Vanhille (Valenciennes), J.C. Aldigier (Limoges), M. Essig (Limoges), B. Barrou (Paris), Y. Berland (Marseille), M. Caillez (Marseille), A. Durrbach (Paris), C. Combe (Bordeaux), Y. Delmas (Bordeaux), D. Fouque (Lyon), D. Glotz (Paris), M. Godin (Rouen), T. Hannedouche (Strasbourg), P. Lang (Paris), P. Le Pogamp (Rennes), C. Legendre (Paris), P. Lesavre (Paris), G. Mourad (Montpellier), C. Mousson (Dijon), H. Nivet (Tours), C. Noel (Lilles), P. Rieu (Reims), E. Rondeau (Paris), G. Touchard (Poitiers), M. Hourmant (Nantes), F. Bridoux (Poitiers), B. Dussol (Marseille), L. Moulonguet (Paris), M. Le Quintrec (Paris), D. Ribes (Toulouse), S. Caillard (Strasbourg), M. Sallee (Marseille), C. Pouteil-Noble (Lyon), M. Büchler (Tours), A. Durbach (Paris), and P. Gobert (Avignon), who all provided us with clinical data for the disease course of the patients with aHUS, and D. Beury, P. Bordereau, and N. Poulain, for their excellent technical assistance. We are also grateful to A. Bacchi for his help with the statistical analysis. This work was supported by grants from the Délégation Régionale à la Recherche Clinique, Assistance Publique– Hôpitaux de Paris (Programme Hospitalier de Recherche Clinique (AOM08198) and the Association pour l’Information et la Recherche dans les maladies Rénales génétiques (AIRG France). This article contains supplemental material online at http://cjasn.asnjournals.org/lookup/suppl/doi:10.2215/CJN.04760512/-/DCSupplemental.